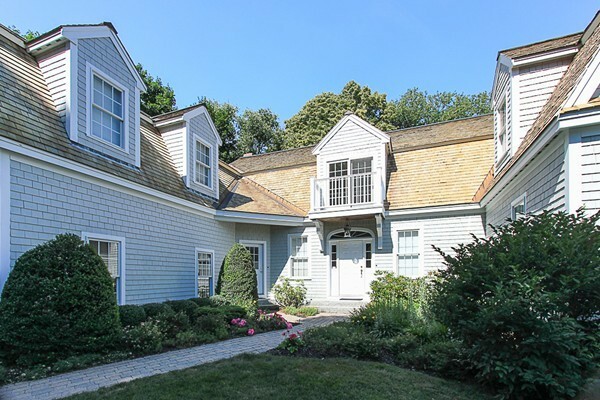 Five Lindens is a stunning classic Shingle Style home. Custom built and meticulously maintained w/many recent updates, on a private 1.44 acre lot among fine estates and nearby Myopia Hunt Club. Welcoming approach down the driveway leads to a beautiful faade accented w/a striking cedar shingle roof. Flexible floor plan conducive to todays lifestyle; fireplaces, varied office space options, and private screened porch with fir floor that connects to the open deck. Views towards back-overlook woodlands and streams. Views out front are more pastoral with just enough integrated landscaping and lush lawn. Well-designed and detailed kitchen offers generous work and storage space, large granite counter with center island and breakfast bar, plus windowed breakfast nook. Kitchen flows into a large dining room with lighted tray ceiling and family room with fireplace. 2nd floor has an open central hallway with sliders that open to allow you to step out to the balcony over the front portico.